Groundwater provides more than 40 percent of California’s drinking water. To protect this vital resource, the State of California created the Groundwater Ambient Monitoring and Assessment (GAMA) Program. The Priority Basin Project of the GAMA Program provides a comprehensive assessment of the State’s groundwater quality and increases public access to groundwater-quality information. Owens Valley is one of the study areas being evaluated. 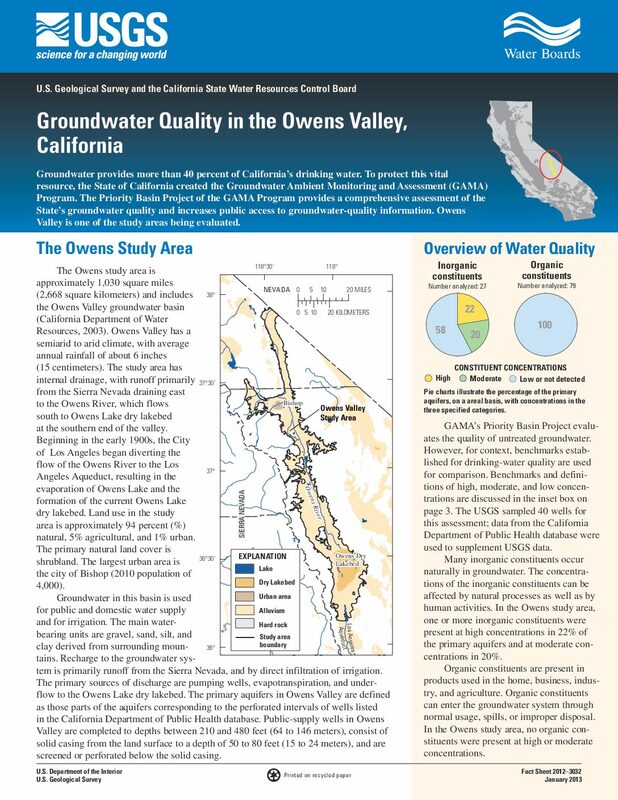 The Owens study area is approximately 1,030 square miles (2,668 square kilometers) and includes the Owens Valley groundwater basin (California Department of Water Resources, 2003). Owens Valley has a semiarid to arid climate, with average annual rainfall of about 6 inches (15 centimeters). The study area has internal drainage, with runoff primarily from the Sierra Nevada draining east to the Owens River, which flows south to Owens Lake dry lakebed at the southern end of the valley. Beginning in the early 1900s, the City of Los Angeles began diverting the flow of the Owens River to the Los Angeles Aqueduct, resulting in the evaporation of Owens Lake and the formation of the current Owens Lake dry lakebed. Land use in the study area is approximately 94 percent (%) natural, 5% agricultural, and 1% urban. The primary natural land cover is shrubland. The largest urban area is the city of Bishop (2010 population of 4,000).